Cana Brava is the work of The 86 Co. which is made up of Simon Ford, Dushan Zaric & Jason Kosmos (founders of Employees Only), Malte Barnekow, and Kris Roth. 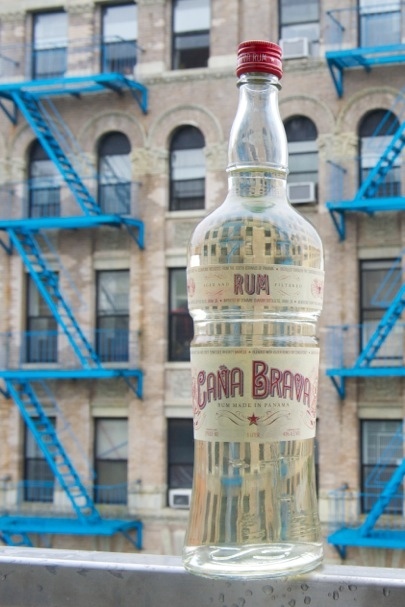 Cana Brava is a 3 year old aged rum from the region of Herrar in Panama. It is made from raw sugar cane molasses that is fermented with aide of natural pineapple yeast. It is then distilled through 5 continous stills. After being distilled it is aged in a combination of un charred new American Oak barrels and used American Whiskey barrels mixture of Bourbon & Tennessee Whiskey barrels). From there it is blended and then filtered 3 times (Carbon, Millipore Cellulose, and Cold Filtration) before being shipped, cut with water, and bottled. The Master Distiller is Francisco “Don Pancho” J. Fernandez who made rum in his native land of Cuba for over 35 years and was the Minister of Cuban Rum. Upon leaving Cuba he moved to Panama and began producing rum again in the mid-nineties. Altogether he has close to half a century of rum making experience. The 86 Co. worked with him in order to create this testament to Cuban style rum. On the nose there is an initial nose of alcohol but not exceptionally strong so as to seer the nostrils. As it opens up it has fresh notes of citrus (lemon & lime), freshly cut summer grass, coconut, sugar cane, and a faint aroma of indiscernible tropical fruits. On the palate there is citrus, vanilla, cocoa, and a faint trace of oak. It opens up sweet and silky and finishes dry and virtually smooth with a faint trace of burn that warms the throat. Overall this is an excellent addition to the white rum category. I could definitely see adding it the roster of my personal favorite white rums like Barbancourt, Flor de Cana, and Brugal. It will add wonderful character to the cocktails it’s mixed in. It retails for about $25 for 1L which makes it an exceptional buy. Review sample provided by representatives of the 86 Co and Cana Brava Rum. Stir all ingredients with ice and strain into a chilled cocktail glass. Garnish with an orange twist. A lovely rum made by a great master and sold by real pros. It’s outstanding and I can’t wait until it is available in the New Orleans market. And as with all of their products, brilliant bartender-friendly packaging. Thanks for listening, Simon and Dushan!